Note from blog host: Here’s the second part of a wonderful adventure, experienced by Janice Osorio of Price Travel. In this post, I will continue sharing my experience at The Explorean Kohunlich. I will talk about the bungalows surrounded by jungle, the restaurant, swimming pool, spa and all of the activities available. The first thing you will notice is the rooms, or rather, the bungalows. It is important to note that there are no TVs or Internet access, but don't worry, you won't miss it – and the lack of technology will make it easier to enjoy the nature around you and the company of your fellow travelers. The Explorean never ceases to surprise you, even in the bathroom, which has a glass door, but no shower curtain! But don't worry, each bungalow is independent and has a privacy wall so nobody can see inside. The next thing that you'll surely enjoy is the hotel restaurant. The food is prepared fresh and is served a la carte. If you have any special dietary needs, I would recommend informing the hotel in advance and the chef will do anything he can to help you count calories or stay away from problem foods. The bar is self-service and you can help yourself to anything you like. If you're in the mood for a pina colada, margarita or other cocktail and you'd like a little help, there's always someone in charge that can do it for you. To really enjoy all the hotel has to offer, I would recommend a reservation at the on-site spa for a relaxing massage, facial treatment, sauna visit or even experience the traditional “temazcal” sweat lodge. And now we get to my great adventure for the trip. One of the activities available is a visit to the nearby archaeological site of Kohunlich, an important city in the ancient Mayan Empire. You get there on a two-mile bike ride. Believe it or not, I don't know how to ride, so I had to walk while everyone else rode, but it was still fun. Just like during my visit the Bacalar, the guide knew so much about the place and taught me so much. His name was Enoch. The highlights included climbing the Temple of the Masks, even though I nearly ran out of breath and had to stop and enjoy the view once in a while. The ride back to the hotel takes you along a special trail through the jungle. It's a five mile ride with amazing views, though since I don't ride, I took the short walk back in only five minutes and spent the extra time swimming in the pool and relaxing in the hot tub. I also did a mile-long hiking trail at the hotel property, listening to the birds and scanning the treeline while watching for deer, mountain turkeys, and even jaguars! The fun thing about the trip is that all along the way, there are messages to motivate you. My favorite was – “Only 400 meters to go!” By this time, those 400 meters felt like four kilometers! When I got back to the trail head, I was greeted with a refreshing towel – nice touch! And then it was time for the only bad part of my stay – the end! And since this a luxury hotel, the service was great all the way through to the end. At check out, I was given a “salbute” fried snack as a nice way to celebrate my departure. It was a good way to fortify me for the trip back and the shiatsu massage also helped me to feel better. This was my experience during a two-day visit. I finished weary as a result of poor physical condition, but I definitely plan on returning. 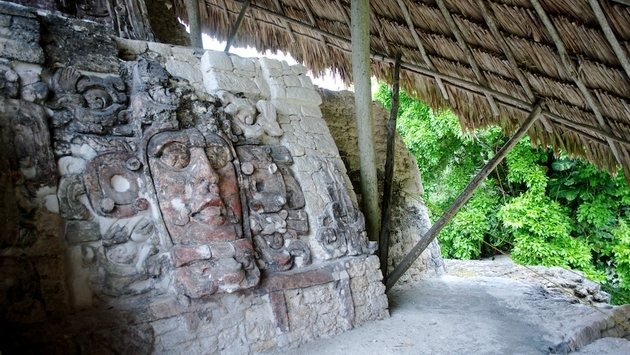 If you haven't been to Chetumal, you are missing the great adventure of a visit to The Explorean Kohunlich! Give it a try, and tell me how you like it! Sai Irene Sánchez Correa holds a Doctoral Degree in Journalism from the Complutense University of Madrid and currently serves as the Public Relations and Social Media Manager for Grupo Posadas. The firm is the leading hotel operator in Mexico, with more than 120 hotels, 20,000 guestrooms, and 15,000 employees in more than 60 destinations across Mexico.